2. For when a little leaner filling is desired, I’ve substituted with ground turkey several times, in the exact same quantity. Nothing else needs to change and it’s great! 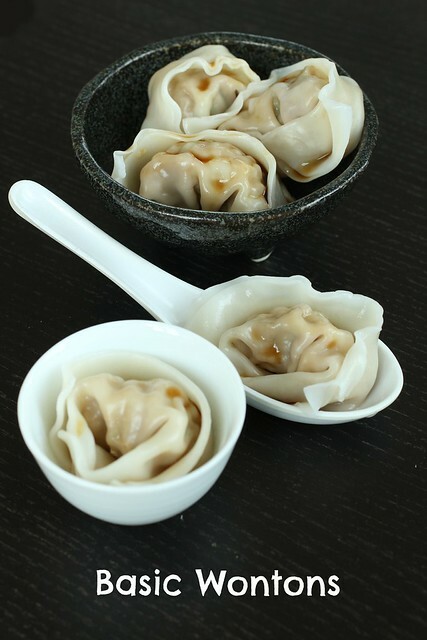 A very experienced pork wonton eater may know the difference, but I think many will not, especially if you use dipping sauces. 3. 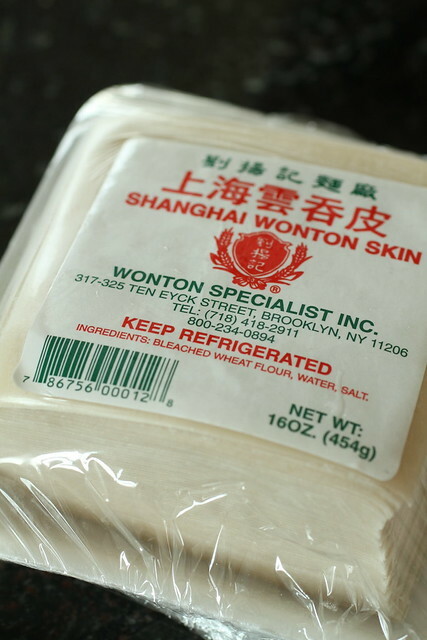 Lastly, I forgot to mention last time that wontons can be eaten as is, with or without a dipping sauce, in soups, or fried. I’m planning some future posts to embellish. 1. 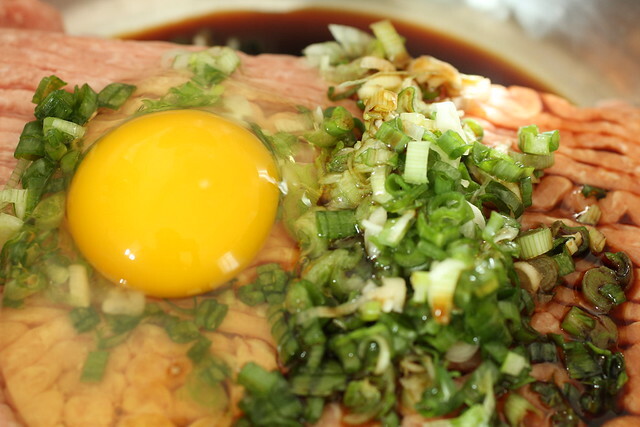 In a large bowl, mix together pork, scallions, egg, soy sauce, and sesame oil. 2. Set up your wonton making station: You need a little bowl with water (this is for you to dip your finger in) and a wet paper towel to lay over the wonton wrappers (to keep them moist). 3. 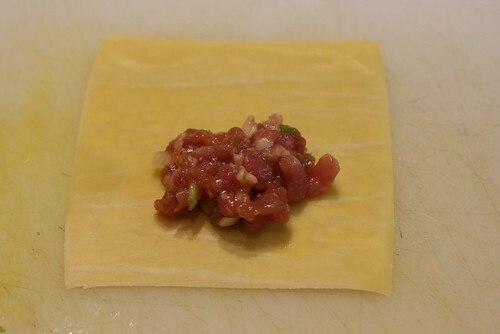 Lay a wonton wrapper flat and put roughly 1 1/2 teaspoon of filling on it, a little below center. 4. Let’s call upper left point 1, upper right point 2, lower left point 3, lower right point 4. 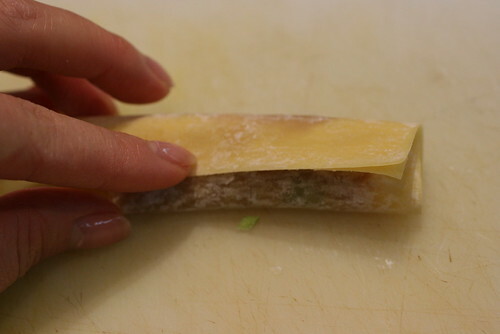 Dab your finger in the water bowl and run it across the top of the wonton wrapper, from point 1 to point 2. Bring the bottom of the wrapper to meet the top and stick together: point 3 meets point 1 and point 4 meets point 2. 5. So now you have point 1/3 and point 2/3. Let’s call the bottom A on the left and B on the right. 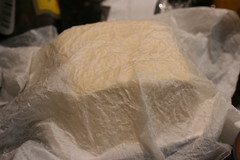 Fold it in half one more time so that 1/3 meets A and 2/3 meets B. 7. Repeat until you’ve used up all the pork filling. You probably won’t eat all of this right away, so lay it in a tupperware container with wax paper in between layers, and store in the freezer. 8. When you’re ready to eat you just boil them. Boiling fresh ones will take roughly 3 minutes and boiling from frozen will take about 5 minutes. Usually they float when they are done. posted by jessica	at 07:55 AM	Filed under Chinese, Recipes, Video. You can follow any responses to this entry through the RSS 2.0 feed. Both comments and pings are currently closed. Thanks so much for posting this! 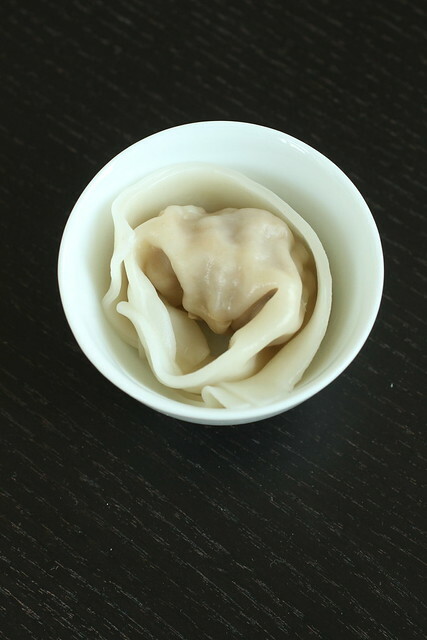 I’ve been wanting to make wontons for a while – I actually have wonton wrappers waiting in the freezer that I can now put to good use. 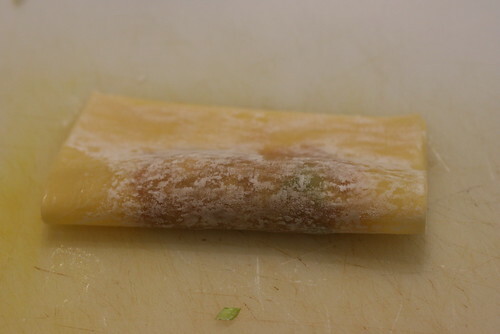 Chocolate Shavings, wonton wrappers do make the process a lot easier. 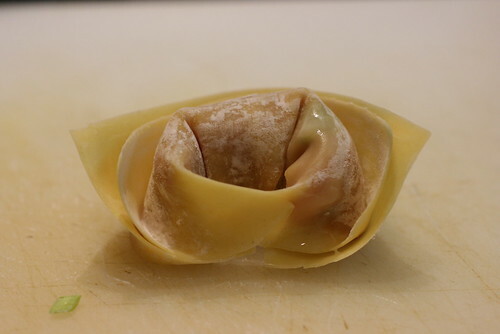 Good job with the forming of the wontons. I know I can’t make them that pretty. Why do you put pork, scallions and soy sauce in your kreplach? Thanks JS, I do them pretty slowly. Bill G, sadly, I’ve never had kreplach, but I’m not too big a fan of pierogis. purelily living, wontons are really not as daunting as they seem. Grace, yes, for me, anything with ground pork = heaven. OMG that’s such a neat way of making wontons! I use the flip method to seal mine and they dont come out that uniformed and take up way too much space. Your’s fit so nicely snug next to each other! 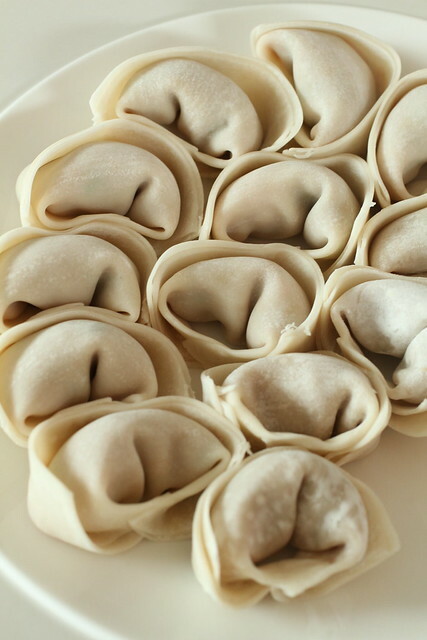 Kreplach are much closer to a wonton than to pierogies actually. K&S;, where can I get a good kreplach? Your wontons are very pretty–and look so good! Pris, when you use water, it works as an adhesive. Bring point A and point B together by putting some water between them and press hard together. I’m sorry it’s so confusing. I can’t figure out how else to explain it since we don’t have video capabilities yet. If it still doesn’t make sense and you want to make it, email me (Jessica[at]Foodmayhem) and maybe I can explain it over the phone. I did it! I made wontons based on your recipe and directions. They were awesome! The video was very helpful. My biggest problem was getting the amount of filling correct. I don’t know why, but it didn’t occur to me what would happen to that delicate sheet of pasta if you put too much filling in, until I sat down to make my first one and split the wrapper and the filling oozed out. After failing with the first few I got it down. I only wasted about a dozen wrappers. I had help from my daughters, 4 and 6. The 4 y.o. gave up pretty early, but the 6 y.o. hung in there and made quite a few good ones, although she had resorted to the folded triangle for most of them. It wasn’t until I was almost all the way done that I got out some chop sticks to put the filling on the wrapper. Much better than the fork. 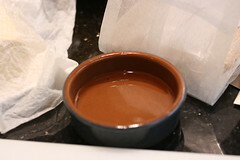 Had about 1/4 of the mixture left over in the end, which I wrapped up and stuck in the freeer. To cook them I boiled them for a few minutes and then fried them in a cast iron skillet with a little oil. The taste of them was perfect. Thanks! Gardiner, so glad you and your girls pulled through. Now you’ll always have great wontons at your disposal!